Why is breakfast the most important meal of the day? Having the right fuel in your tank sets you up for a successful day ahead. When you feed your body the right mix of fats, carbs and protein, you get higher brain function, greater alertness and energy that lasts for hours. If you skip breakfast, on the other hand, you can become irritable, tired and unfocused. 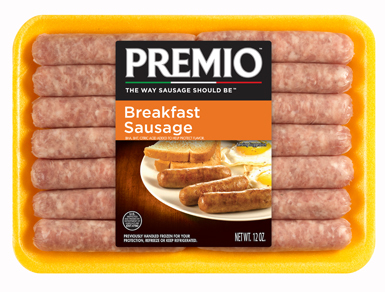 Start your day off right with the best breakfast sausage links, made by Premio Foods. We offer five different types of links, from maple-flavored to low-fat chicken sausage varieties. Whatever type of breakfast you crave — whether it’s savory, hearty or light- Premio Foods’ sausages can help you start your day on the right foot. Getting enough protein each morning helps your body repair any damage it suffered the previous day and power up for a morning of school, work or running errands. Reward yourself with a delicious breakfast that’s also good for you, and see for yourself why this meal is the key to having a great day! At Premio, we understand why you want to feed your family right. We’re a family-owned business that has thrived for more than four decades on our commitment to feed families just like yours. We make our sausages with you and your family in mind. We provide you with the right nutrition to get through every busy day and we understand how important it is to feed your loved one’s high-quality food you can feel good about. Our sausages contain only the finest ingredients. We call on our family tradition of sausage-making to offer the best blend of spices, butcher-quality cuts of meat and seasonings. We’re also health-conscious. Many families watch their fat intake to keep weight gain in check and guard against obesity-related diseases such as diabetes. Our chicken sausage has 60 percent less fat than USDA regulations for pork sausage, making it a nutritious and healthy choice for your family. And the best part? It still tastes just as juicy and delicious as our regular sausage! Pair chicken breakfast sausage links with an egg-white omelet or a bowl of oatmeal for a heart-healthy breakfast that’s guaranteed to keep you full for hours. 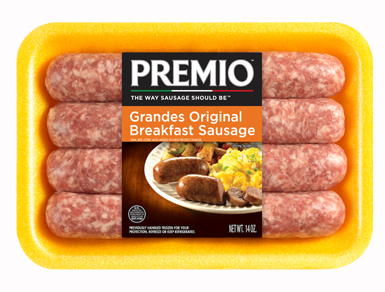 Whatever type of sausage you crave, ranging from Italian to breakfast or to spicy, you can buy it from Premio Foods. We make a commitment to our customers to offer the best possible quality of sausage. That commitment carries over to our employees and our community, too. We feel confident in earning our reputation one happy sausage eater at a time. Are you ready to try the best breakfast sausage links available? Use our store locator to find a location near you that carries Premio Foods products or buy them from us directly online. Start prioritizing the most important meal of the day. When you make a delicious and nutritious breakfast, you set your family up for success. Make our breakfast sausage links a part of that smart daily commitment!